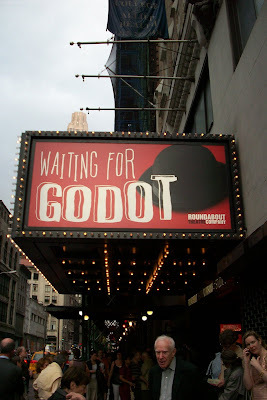 I went to see Roundabout's revival of Waiting for Godot expecting to be intellectually challenged and overwhelmed. Sadly, I was a victim of my own self-fulfilling prophecy. Mike and I didn't even stay for the second act. This was the first time I ever left a show, which left me feeling disappointed, subversive even. But I didn't think I could sit through another hour of a play about nothing. Two men wait for a man named Godot who they apparently don't really know. So they pass the time as best they can, at one point even contemplating hanging themselves from the tree they were told to wait by. A man named Pozzo passes through on his way to the fair to sell his slave Lucky. They eventually depart, and the two men are back to their lonely vigil. Mike and I also took our leave. We all bring our own interpretation into anything we read, listen to or watch. Mine leans towards the religious. There were many Biblical references in the first act. Vladimir talked about the 2 thieves at the Crucifixion, and how only one was saved. There's two men waiting for Godot. There's a little boy at the end of Act I with a message that Godot isn't coming until the next evening. Was he an angel/messenger? (We also find out that he has a brother, who Godot beats. Why does Godot only beat the other one?) Is Godot God or Jesus? Is it about taking control of your life and not passively waiting for things to happen? Is it about obedience (the men are told to wait, so even though they want to leave, they don't)? The servant Lucky who wouldn't put down his bags, is it about letting go of the baggage we all carry around, how we are enslaved by it? Or is it saying that life is essentially meaningless, that everything is nothing. Nothing happens in life, that it is just a series of conversations, meals, games, sleep, etc. Is this post becoming a stream of consciousness discourse? Is this going nowhere fast? Maybe if I finished the show, I'd have a little clarity. But then again, maybe not. The minimalist set design clearly goes with the play's theme. The amazing cast includes Nathan Lane (Estragon/Gogo), Bill Irwin (Vladimir/Didi), John Goodman (Pozzo) and John Glover (Lucky). The actors are wonderful, especially Mr. Irwin and Mr. Glover. The latter's performance is mostly silent and physically exhausting, but when his master orders him to (awkwardly) dance and "think" (i.e., a jumbled, irrational monologue), he shone while making my heart ache. Unfortunately, my inability to wrap my head around the playwright's intentions outweighed my admiration for the performances. That's what makes art interesting. We just have to try everything, experience everything. And it's fine to leave at intermission. Ha ha a fitting title!